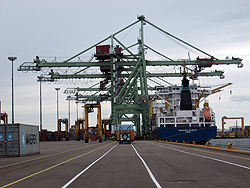 Terminal Operations in the Port of Kotka, Finland. Photo by Stacey Carlson. In June 2007, a partnership was formed that would bring together maritime interests from the Great Lakes and Finland. Dr. Richard Stewart, co-director of the Great Lakes Maritime Research Institute (GLMRI) and Prof. Jorma Rytkönen, research director of maritime and port operations for the Kymenlaakso University of Applied Sciences, understood that with the similarities of the environment, climate, and industry of the Great Lakes and the Baltic Sea, a partnership would benefit government and maritime industry officials, researchers, and students. In September 2008, GLMRI strengthened that partnership by organizing and co-sponsoring a tour of Finland’s maritime industry. The week-long agenda brought Great Lakes and coastal shipping advocates to the Baltic Sea to observe maritime operations. 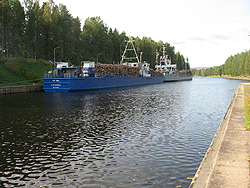 Ships along the Saimaa Canal. Photo by Stacey Carlson. Craig Middlebrook, St. Lawrence Seaway Development Corporation, Washington, D.C. 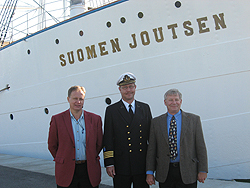 Standing near the Suomen Joutsen, a former Finnish naval ship in Turku, are Jorma Rytkönen, Captain Kari Riutta, harbour master of the Port of Turku, and Dr. Richard Stewart. Photo by Stacey Carlson. Throughout the week, the group toured the Finnish ports of Vuosaari, Kotka, and Turku, traveled to the Saimaa Canal, and took a ferry to Tallinn, Estonia, where they met with the Port Director. In Helsinki, the group met with the Finnish Maritime Administration, toured the Helsinki VTS, discussed vessel operations with Unifeeder, met with the Helsinki Commission, and toured the RFID lab in Vantaa. Research presentations were provided by the Kymenlaakso University in Kotka and the VTT Technical Research Centre of Finland, and focused on winter navigation, icebreaking operations, ballast water research, and AIS/VTS systems. GLMRI also presented to faculty and students at Kymenlaakso University on research, maritime education, and Great Lakes operations. The group visited the Aker Arctic Research Centre in Vuosaari and the Aker shipyard in Turku, where they received a tour of the cruise ship under construction, the Oasis of the Seas.